Ronnie O’Sullivan will face John Higgins in the first round of the Hong Kong Masters next month as many of the world’s top stars gather for the invitation event. Organized by the Hong Kong Billiard Sports Control Council Co. Ltd. (HKBSCC), subvented by the Leisure and Cultural Services Department (LCSD) and sanctioned by World Snooker Limited (WSL), the Hong Kong Masters 2017 will be staged at Hong Kong’s Queen Elizabeth Stadium from 20 to 23 July, 2017. Not only will it be one of the major celebrating events of the 20th anniversary of the establishment of the Hong Kong Special Administrative Region, it is also the most-anticipated snooker event in Hong Kong in decades, featuring eight of the world’s best snooker players in the main tournament. There will also be exhibition games on July 23rd featuring legends Jimmy White and Stephen Hendry as well as Hong Kong’s Ng On Yee, the women’s World Champion. These players will be competing for the title as well as a total prize money of £315,000. The Exhibition Game will take place on the last day of the tournament, where Whirlwind White and seven-time World Champion Hendry will play against local elite player On Yee, showcasing the charisma of the sport of Snooker. Mr. Raymond Fong, Tournament Director of the Hong Kong Masters 2017, said: “The Hong Kong Masters 2017 will be held and regulated in accordance with the standards applicable to all current televised professional snooker tournaments. “The Main Tournament will adopt a knockout system. There will be four quarter-finals on 20 and 21 July that are best of nine frames, and two semi-finals and the final on 22 and 23 July that are best of 11 frames. 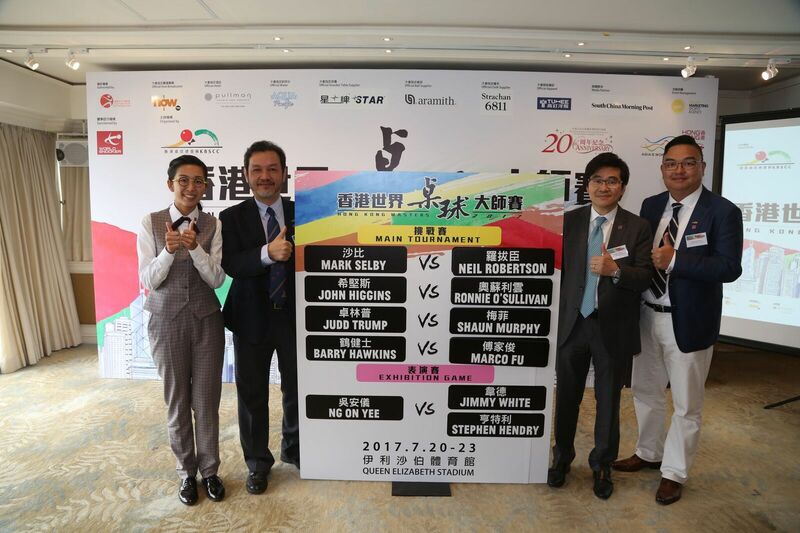 The Hong Kong Masters 2017 has received tremendous support from various sponsors and partners including: official table supplier STAR, official ball supplier Aramith, official cloth supplier Strachan, official hotel the Park Lane Hong Kong, a Pullman Hotel, official apparel TUXEE, official water Aqua Pacific, official host broadcaster Now TV and media partner South China Morning Post. Tickets for the Hong Kong Masters 2017 will be opened for sale from 22 June. For the quarter-finals on 20 and 21 July, ticket price ranges from HK$100, $200 and $300. For semi-finals and final on 22 and 23 July, ticket price ranges from HK$150, $300 and $450. A 50% discount will be offered to full-time students, the disabled and seniors over the age of 60 (Discount is not applicable for the $450 tickets on 23 July). Tickets will be available at various outlets of URBTIX as well as via online, phone app and hotline booking. For more information on ticketing, please visit www.snookermasters.hk. For more updates on the Hong Kong Masters 2017, be sure to follow the event official website at www.snookermasters.hk and Facebook page @hksnookermasters.